If Pilea caderei were a person, it would be a teenage boy: it wants to be everywhere at once, is more often in an awkward phase than not, and needs a grower who can set some boundaries once in a while, lest it throw wild drunken parties all night long. Most of the difficulty is from the light and humidity needs, but, as I've hinted above, regular grooming is also more important than it is for most plants. Plants tend to get leggy pretty quickly, and sooner or later you reach a point where no amount of pruning is going to be enough. Fortunately, it's very easy to start new plants: I've started several at work, in the greenhouse, and had a success rate of around 90%; my track record at home is, if anything, better. And this is without doing anything special to the plants at all: cut a piece off, stick it in wet dirt, and wait, and nine times out of ten it'll be fine. They're not enormously popular plants: I see them for sale occasionally in Lowe's and Wal-Mart and the like, but it's pretty rare. I suspect the deal is that although they're easy to produce in the first place, they have a very limited effective shelf life, due to their tendency to get leggy in a big hurry. In the home, this is totally controllable, and only takes the occasional pinching back or restarting, but pinching back takes time which could probably be more profitably directed elsewhere, and also the plant actually looks worse, not better, for a little while after a good pruning, so it would be hard for your average box store manager to see the point.2 Also, from a retail perspective, a plant is a plant, and if there's one type with a limited shelf life that needs a little extra work and one with a longer shelf life that can just sit there, you're going to sell the longer one. Period. Which is too bad, I think. I don't know for sure that mine are going to make it through the long, dry winter; I've got them in the bathroom (along with my Dizygotheca elegantissimas), and we'll see how it goes. If they don't do well once it gets dry and cold, then I suppose we have part of our explanation for why you don't see more of them. So far, I haven't had any noteworthy problems outside of a couple failed cuttings. As far as work goes, we've sold a few, though they seem to move the best when they're very small and cheap: all the 3-inch pots I made up sold, while most of the 4-inch ones are still there. This may or may not mean anything, since I can't remember how many I made of each. 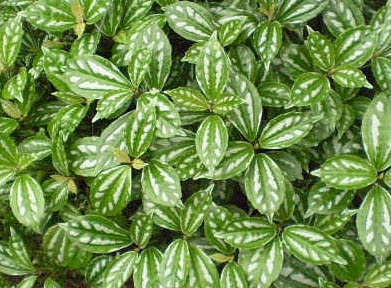 3 Another plant I suspect of being "uncool" at the moment is grape ivy, Cissus rhombifolia, which I see only very occasionally in stores. Customers asked me for it a lot, though, this summer, so maybe it's making a comeback. We got a lot of them in in the big mid-October tropical shipment, and a few have sold already, so perhaps. Stuff like wandering Jew (Tradescantia zebrina) is kind of doomed to perpetual uncoolness in the trade, because it's too easily grown and passed around from cuttings, and also it takes almost no time at all before leaves and stems start dying back and then the whole thing just looks messy: nobody really has the time to keep taking cuttings and planting them in the pot to fill it out again, though we try sometimes. Agree about the legginess, Mr. Sub, I have had one for almost two years now and its growing along those lines. I was surprised to learn about the humidity requirements, mine doesn't get all that much but it's doing well. It went through a bad patch when I moved it to a south window - leaves browning and dropping, I clipped them and moved it and now it's just fine, back to normal (tho as mentioned, getting leggy). Love these plants, your pics are great. I hardly ever see them here in NYC in the plant stores, which is a shame, I would like to have at least 2 more. Looking forward to the next installment! You are an extremely skilled writer, it's always a pleasure to read your posts at gardenweb. So sorry about your husbands cat, which you mentioned in an earlier entry. Take care. 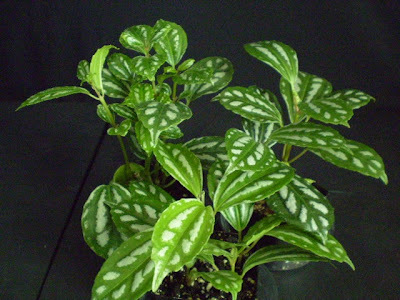 I have a Peperomia obtusifolia that I just purchased, and its newer leaves have splits in them. Any ideas why, or how I can remedy this? Also the lower leaves of my Pilea Peperomioides have been turning brown and falling off, can someone tell me why? It was sitting next to a drafty window, but I moved it to a room that is warmer when I saw the first browning of the leaves. It seemed to get worse after I moved it, so I changed it's position in the warmer room (moved it farther away from the heat source) and it seems to be a bit happier. Well, it's very much a guess, but I did have a Peperomia argyreia that was getting split leaves all the time, and it stopped doing that when I stopped letting it dry out as much between waterings. I don't know if obtusifolia would work the same way or not. I just got one of these because I thought it looked cute and not too showy, and its tag said it would be fine in low light. I'm a bit of a plant newbie, though - I've never done much more with plants than water them. When it gets to the pruning point, how do I do that? Is there a part of the plant that's best to cut at? My luck with plants has been pretty hit or miss - I had overwatering issues with a cactus, but I did great with a bamboo plant, and then there was a green leafy plant (I never knew the name of it) that I did well with for several years before my family's cat knocked it over one too many times. My success with the green leafy is probably another reason I was attracted to this one - I'm hoping it will be able to tolerate me just as well. As far as whether you'll do well with it or not, I don't know. Pileas have been, in my experience, not nearly as difficult as the books make them sound, but cold temperatures and dry air are both dangerous, and they don't like it when you miss waterings. They do wilt slightly when they need water, so put your plant in a spot where you'll end up looking at it a lot, and watch for the leaves to droop, then water thoroughly and drain off the excess. Thanks for the tips! It's warm and humid in my area for a large chunk of the year, so at least that should help, and, if it does well, I might get brave and try growing my very first plant from cuttings. :) My main problem with plants seems to be a tendency to overwater, so I think I'll have to watch out for that more than underwatering. great article! don't keep the plant under direct sunlight. @library girl,thank you very much,your advises and explanations are very helpful.